With a mission to innovate how brands connect with people, Dentsu Aegis Network helps clients understand the industry's shift to online video. Mike Law, EVP of video investments at Amplifi, Dentsu Aegis' central investment arm, shares the results of its tests on how to get the most out of your YouTube ad mix. Here's the thing: Across the Dentsu Aegis Network, we're increasingly sold on online video for our clients. We have done significant research on effectiveness, and the fact is, like-for-like ROI is 50% higher in online video than linear TV.2 When planning new campaigns for our clients, it's not a question of if we should shift dollars to online video and YouTube, but where and how. We partnered with Google to figure out how we should think about YouTube's two main ad formats: non-skippable Google Preferred 15-second and skippable TrueView 30-second ads. In a live controlled experiment, we showed the same creative from one of Dentsu Aegis Network's largest consumer packaged goods (CPG) brands to the same people in various combinations of the two formats; we also tested five additional campaigns from other categories to see if the CPG brand results were normal. Like-for-like ROI is 50% higher in online video than linear TV. The bottom line? We found that there are many effective ways to invest in YouTube, and it can be simpler than we sometimes make it. Both Google Preferred and TrueView can drive results no matter the marketing goal. And when combined, these formats can work even better. Whether the campaigns ran only on Google Preferred or only on TrueView, the brands we tested saw significant lifts throughout the funnel. In a world where brands have more and more instruments to choose from to build out their orchestra, our experiment showed that both Google Preferred and TrueView can be the attention-getting horn, promoting brand awareness and ad recall, or a more subtle instrument, raising brand favorability and purchase intent. We think of Google Preferred lineups like Food & Recipes, Entertainment & Pop Culture, and News as interest-specific cable channels like MTV, Bravo, or TBS. This valuable inventory with YouTube's most passionate audiences not only extended the reach of our client's campaigns, but also had a strong impact on the upper funnel when added to TrueView-only campaigns in our test. The highest scoring ad had 165% higher lift in brand awareness and 146% higher lift in ad recall. 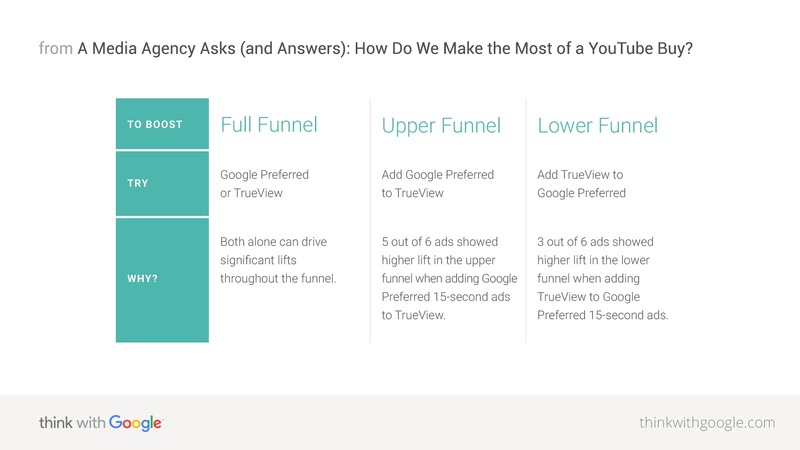 Three of the six ads we tested showed higher lifts in lower-funnel metrics with TrueView added in, compared to when Google Preferred ran alone. The highest scoring ad had 59% higher lift in purchase intent by adding skippable TrueView ads to the mix. This is a strong reminder that views and completion rates alone don't tell the full story. Perhaps the power of TrueView skippable ads can be explained by the old marketing adage that roughly 20% of the target audience makes up 80% of a brand's sales. The skip button does the work to find the people most interested and weed out the ones who aren't. This experiment also opens up exciting new questions we're eager to explore. For our clients that are already running a mix of Google Preferred and TrueView, we're interested in exploring how we tap into each format's strengths with unique messaging. By leaning into the data, we can open up new ways to help our clients get the most out of their investments in online video. A 25-minute, in-home controlled experiment was conducted among 6,004 total respondents on live YouTube. Respondents were 18-to 54-year-old U.S. residents, a mix of different ages and genders, desktop or Android smartphone users and past one month YouTube users. 1 Google-commissioned Nielsen study, U.S., audience time spent on TV, mobile, and desktop, Nov. 2015. 2 Data2Decisions TV Stack Meta-Analysis 2015. 3 The test ensured the ads received the same number of impressions whether they were shown with Google Preferred and TrueView or with TrueView alone.